One of the key goals of the Whitecaps new USL side is to provide a place to play, develop and gain competitive minutes for their top young prospects. The crucial missing link between the Residency and the MLS first team. 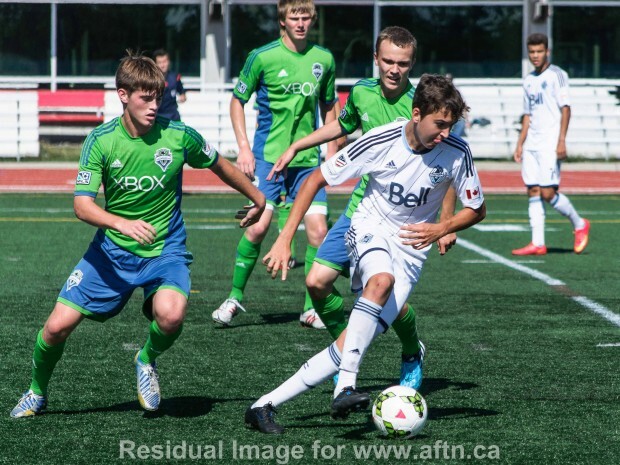 A few of the current Whitecaps U18 players were expected to see some minutes of USL action with WFC2 this season and many more in seasons to come. One player in particular that we know Carl Robinson was keen to see at the higher level was striker Dario Zanatta, but with minutes in the pro ranks likely to be limited at first for the Victoria native, the 17-year-old has decided to quit the Whitecaps and pursue opportunities over in Europe in the next stage of his soccer career. A loss for the Whitecaps, but a chance too great to pass up for the player. Zanatta flew out of Vancouver just over a week ago. Now that he’s had time to settle in to his new surroundings, AFTN caught up with the Canadian U18 international to discuss his time with the ‘Caps and what lies ahead for him now on his footballing journey. Dario Zanatta is a goalscorer. A striker, who can also play in midfield roles, he joined the Whitecaps Residency program in September 2011 and has been productive on the pitch ever since. As a 15-year-old, he led the ‘Caps U16s in the scoring department during 2012/13 with 8 goals in what was a tough developmental year for a very young team. Last season saw him split his time between the U18 and U16 sides, grabbing 26 goals in 28 games in the process. Moving up full time to the U18 team this season, Zanatta and Marco Bustos have torn apart the opposition, as the young Caps were rated the number one team in the USSDA at one stage. The pair have scored 31 goals between them, with Zanatta netting 15 from his 19 appearances. It was shaping up to be a potentially record breaking year for the player and the team. When we last spoke with Zanatta back in May, his goal was to secure a professional contract and ideally one with the Whitecaps. With his form impressing Robinson and the formation of the new USL team, that looked pretty much a certainty somewhere down the line. But things move quickly in football. Unable to come to agree terms with the Whitecaps to continue his time in Vancouver, Zanatta has now made the bold decision to quit the club and jet off to Europe to continue his footballing career. It might have come as something of a shock to those who follow the ‘Caps Residency program, but it was a decision that had been a long time coming and deliberated over. For some the timing might seem a little strange. Both the European and the USSDA seasons will be wrapping up in the next few months, so why not wait until the summer? But for Zanatta it was a case that this was actually the ideal time to head off and pursue his dreams. Those opportunities have come in Europe. IFK were the club that Darren Mattocks had a training stint with in January. The Goteborg scout had been over in Vancouver watching the Jamaican but had also taken in some Residency games in the process and liked what he saw from Zanatta. A lot of young players in North America (as with elsewhere in the world) dream of getting a chance to play in Europe. Even the pros here like Octavio Rivero and Christian Dean have mentioned that is in their long term goals. Zanatta now gets the chance to do just that as a 17-year-old, which must create a gamut of emotions, especially as he has headed over there on his own. “I am beyond excited to be in Europe, working on trying to live the dream that lots of young Canadian players also have, which is to play in Europe. He’s not the first Whitecap Residency player to head off to Europe. Amongst them, Alex Comsia is in France, Ben Fisk is in Spain, Caleb Clarke headed off to Augsburg in Germany and Daniel Stanese is still there with the same team. Dario knows all of the guys, so did he get the chance to speak to any of them about their experiences in Europe and if so, what did they tell him? Over here, players seem to be able to carve out pro careers when they come out of college at the age of 21, 22, 23. In Europe, a lot of guys are done if they haven’t shown their stuff by the age of 21. A frightening stat I read recently was that around 10,000 lads are in the academy system in England. Only 1% of them will go on to make a living out of the game. And of those 18-year-olds given professional contracts, two thirds of them will be out of the pro ranks by the time they reach 21. Food for thought, but talent does prevail. Zanatta has already impressed in Goteborg, playing 75 minutes for their Under 19 side at the weekend and scoring. Dario turns 18 in May. With that desire to play in Europe, was the feeling there that now is the right time to try and make it there or, as crazy as it sounds, he might be deemed too old to get another chance? As we all know, the ‘Caps have their new USL team all set to get underway this year, and a big part of that team is to help give playing time to their young talent, especially Residency prospects. Even if Zanatta was included in the USL mix this season, minutes were still going to be limited for him there. So was the prospect of getting more competitive minutes in a pro environment elsewhere a big factor in deciding to go to Europe instead of staying here? And he’s right. We’ve seen it with the likes of Marco Bustos and Kianz Froese. The USSDA level wasn’t taxing enough for them at this crucial stage of their development. The ‘Caps clearly agree and Bustos told AFTN recently that he would no longer be playing with the Residency team going forward. So did the Whitecaps get to the stage of actually discussing a USL or pro contract with Zanatta? What doesn’t appear to be likely is the door being left open for Zanatta to return to the Residency and/or the ‘Caps if he decides that Europe isn’t for him. Zanatta has been with the Residency since September 2011. There’s a lot he feels he’ll take away from his time in the program and how it has helped develop his game. A new challenge now awaits Zanatta in Europe. To make it to that next level and succeed over there, Dario is aware of the things that he needs to work on most in his game. So an exciting adventure awaits Zanatta and we’ll be following his trial in Sweden, and hopefully his next stage of his career with IFK Goteborg, with interest. It’s always tough to see a talented young player in the Whitecaps ranks have to move to elsewhere to try and make it, but often it is better for both the club and the player that it happens. That certainly seems to be the case with Dario Zanatta. It’s been fun watching him play with the U16s and U18s these past couple of season and we wish him nothing but the best for the future, and who knows, we may still see him in a Whitecaps jersey again some day. So does he have a parting message for the ‘Caps fans and his former teammates?